This is it: the place where serging begins, and it leads you and your sewing skills to a dynamic future. Vibrant is the perfect introduction to the art and craft of serging, especially for garment sewers who want truly finished edges. With Vibrant, serging isn’t scary – it’s genuinely exciting! Finish all your projects with quality and versatility - easily switch from 4-thread, 3-thread, 2-thread and rolled hemming for a different look and finish every time. What mess? Attach this handy bin to the front of the Vibrant and those loose threads and scraps are caught right up as they fall. Forget fumbling with scissors, Vibrant features a thread cutter that pops up with just a quick push. New to serging? Don't be afraid! Following Vibrant's color-coded thread system, you'll have your serger threaded in no time at all! Want to add gathers to your next project? 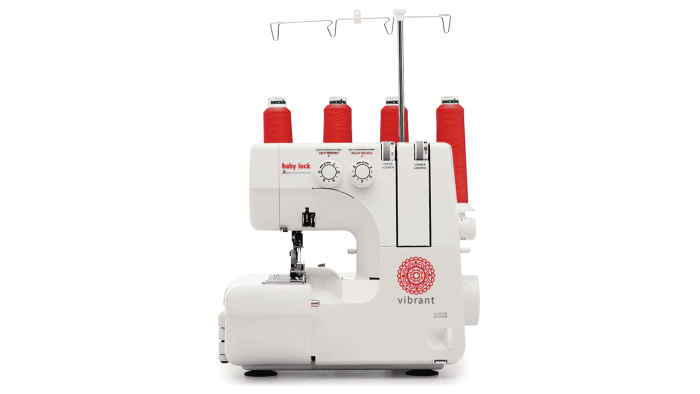 Vibrant's differential feed allows you to increase or decrease the fullness in the fabric, making sewing easier on tricky fabrics. Use Vibrant's easily adjustable tension settings for a truly balanced stitch every time you serge.